With new album Edguy hit the road for their Age Of The Joker Europe 2011 Tour. 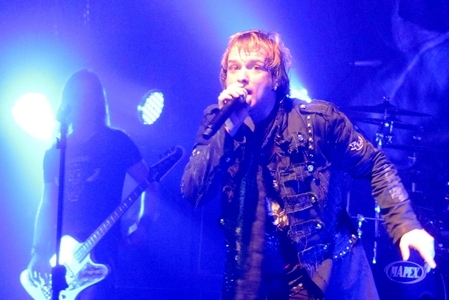 Three shows had to be re-scheduled due to an virus infection of fronter Tobias Sammet. In Spain, Jens Ludwig caught a flue and had to sit the whole show time at their last Spanish show. With an day-off in Saarbrücken they had time to cure their flues and gather some new energy for their very own little tour bus war. October 18th was a cold and rainy day so waiting outside the venue wasn't fun at all. But some die hard fans were there even two hours before opening. The venue was filled for about 75% when Kottak (featuring James Kottak / Scorpions) hit the stage to celebrate their LA hard rock. The music was ok. I didn't knew any of their songs, so time passed by while waiting for Edguy. Soon after finishing their set, Kottak left the stage. After a short change over it was time for celebrating the age of the joker. 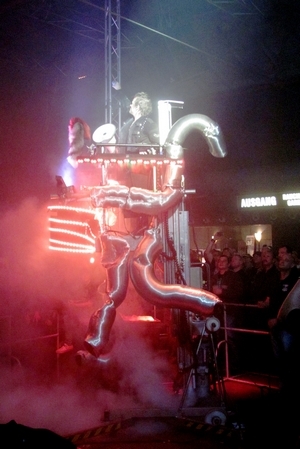 A circus theme introduced the band before they started with Nobodys Hero. So the internet news said that flue was spread among the band members, but they seemed to be in a very good condition. I missed some energized stage acting, but I think that's because of the flue... ;-) Nearly half of the songs were from the new album and in my opinion they are sounding great when played live (and on CD, too). A highlight was when Toby left the stage after Behind The Gates To Midnight World and climbed a lift at the FOH place. It was Toby's very own rocket ride and then they played Superheroes. Nice gag. Other highlights were Ministry Of Saints, Vain Glory Opera, Rock Of Cashel and Land Of The Miracle. I hope to see them next time in summer with better weather. It should have happened in May 2009, but it was cancelled and re-scheduled for late August. Edguy should play at the Wacken Rocks Southside / Seaside festivals which had to be re-scheduled due to bad weather conditions. So it was time to travel to the Garage in Saarbrücken again and to listen to two great bands: Edguy and support act Powerwolf. For Powerwolf it's a home match here and they were out to presented their new album Bible Of The Beast. They are famous for their wolf-based lyrics combined with a great show and precise playing. They started with Raise Your Fist, Evangelist, the opening song of their new album. The crowed got introduced to the power of Powerwolf with the very first note! I really got a goose skin when they performed their church choirs live! All in all they did a very great show with very great songs! Sadly I missed the song In Blood We Trust, but songs like We Take It From The Living, Panic In The Pentagram or Kiss Of The Cobra King made up for that. It was a really great evening with two great bands! Everybody who does not know Powerwolf - check them out! Wolves don't pray! Last year Edguy played a special show at the end of their tour in Wartenberg - a small town in the area they live. This year they celebrate their 15th anniversary and decided to play 2 shows at the same venue. And soon Saturday's show was sold-out, but on Friday tickets were still available. As special guest on both nights Germany's metal queen Doro was entering the stage. The blonde singer and her band started again with Earthshaker Rock. As they played a shortened set they kept rocking and sped up a little with Always Live To Win. For years I Rule The Ruins was their set opener, but there are more songs which are a must-play and so surprises couldn't been expected. But the band had a surprise for the fans - a special guest on guitar... Chris Caffery (Savatage / TSO)! Even if it wasn't the first time Chris Caffery joined them live on stage, but this time there was a little more time and so they rocked the house with Burning The Witches, All We Are and the Judas Priest cover Breaking The Law. Especially the cover did sound more aggressive then on their last tour. A good show and lots of fun for the fans. After a break it was time for Edguy to enter the stage. This time they wanted to play some songs which haven't been played live - at least not recently - and started into their set with Spooks In The Attic. But a few classics made it onto the set list - see below. The crowd was going nuts, even if some songs seems to attract fans of their early albums while others are more welcome by fans who discovered the band just recently. As usual Tobi Sammet was always in action and entertaining the fans. That they all had fun on stage was obvious - they were all smiling, laughing and joking. Last year some short Star Wars scene was leading into the drum solo, this time only a musical intro. To be honest the drum solo couldn't convince me. Felix is a good drummer, but his solo isn't surprising. Two more songs and the regular set was over, but the fans wanted more! They shouted loudly for some more and so the five-some returned for Avantasia and King Of Fools. Last, but not least they played Vain Glory Opera. The fans were happy and even if some stayed for the metal disco others were on their way home. I saw Edguy already at the club headliner show in Belgium almost 3 weeks ago, now as they play Cologne I took the chance to see the whole package. 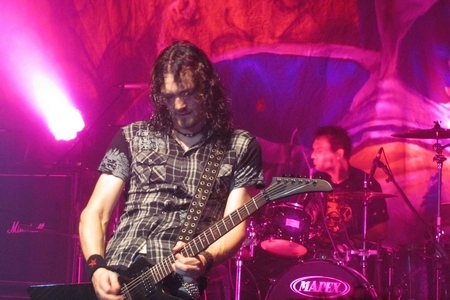 Next were the British DragonForce who came to present Inhuman Rampage live. In the U.K. they are so successful that they headlined the shows there and Edguy played the second slot. I haven't heard the new album of DragonForce yet, but I liked the first releases. I saw the band already live when they supported W.A.S.P. and have to confess that live they couldn't convince me... This time on the road with a new line-up, on bass now the former Heavenly guitarist Frederik Leclercq. Live the French man fit in very well. Guitarists Sam Totman and Herman Li not just shredded their guitars, they posed, jumped and tried to entertain the audience. In comparison with the wild show of the guys singer ZP Theart was the constant factor. In my opinion the extremely fast songs don't give ZP the chance to show his abilities properly. Beside that the band hadn't a good sound which I blame their sound tech for, coz Sabaton had a better sound. There were some DragonForce fans and so the extreme power metal was welcome, but for the majority of metal fans the set of Inhuman Rampage songs - only one song came off their debut, it's title track Valley Of The Damned - were too much alike. Some slower ones would have give the headbangers a break and would have attracted more fans. From what I can say after listening to the new material live is that a larger variety and some speed changes would do no harm. They would still be extremely fast. They have their fans, but I'm not part of it. Sorry guys, you did a good job, but not my cup of tea. Time for a change over and then Edguy announced their show by using an old German song of a band called Rodgau Monotones. It was obvious that Edguy wanted to give something for the money and so they came with a stage set incl. stairs and a big light show. The first song the five presented was Catch Of The Century of their 8th studio album - Rocket Ride. Songs like Sacrifice from their latest release or older ones like Lavatory Love Machine and Vain Glory Opera fulfilled the fans hopes. Between the songs Tobi was telling jokes which showed his strange humour. But making jokes about Cologne carnival or their soccer team aren't what most fans want to hear. But well, that's Mr. Sammet's humour. Guitarists Dirk Sauer and Jens Ludwig as well as bassist Tobias Exxel posed - reminded me a bit of Accept... - and headbanged. In the middle of the set it was time for drummer Felix Bohnke to show his abilities. First the stage turned dark, heavy breathing,  then you hear the famous dialog of Star Wars: "Lord Vader" - "Yes, Master?" - "Rise". Then you see Felix with a Darth Vader mask and he started his drum solo along Imperial March. With Trinidad they later tried to spread some Caribian feeling - but didn't really succeed. The band enjoyed playing and frontman Tobias Sammet was always in action - a bit like David Lee Roth in the 80's.... When they returned for some more Tobi announced a cover version and the fans showed their dislike, but after the first notes the reaction changed, coz it was Avantasia's Sign Of The Cross. Last, but not least they played King Of Fools. They had only 90 minutes and I would bet that their fans had tons of songs which they would like to hear. Perhaps next time they present some of them.... Anyway, their fans left satisfied. Edguy presented a good show with some visual effects and a great light show. For the ones who missed them on tour, the guys play some festivals this summer, but there they might have less stage time and can't bring their show effects... At least a chance to see them. It was the first headlining tour for the German youngsters Edguy and they had an interesting package with them. Next in line today were the Finnish band Lullacry, a band which doesn't really fit into the package. Edguy and the other supports play melodic power metal, but not Lullacry! Singer Tanja and the boys play powerful heavy rock with gothic elements. Be My God is their 2nd album called and because their debut isn't available outside Finland they concentrated on the songs of that one. The quintet presented the title track, Damn You and with Sweet Desire the title track of their debut. Tanja has a dark, powerful voice and so the fans were blown away by her cover of the W.A.S.P. classic Love Machine. It took awhile to make the people move, but at the end the fans seems to like it. Hope to see them again soon! Today Heavenly were the 3rd to enter the stage, but due to the interviews I missed part of their show, the same with Edguy, but at the Biebob in Vosselaar I had the chance to see their shows, but missed due to a traffic jam the others. In Vosselaar the French came on stage to present their helloweenish metal. Back from France where Heavenly are one of the most famous national metal bands these days they were motivated to conquer the metal world outside of France. On the 2nd album Sign Of The Winner the band present a new line-up. Live some might saw them when they toured with Stratovarius back in late 2000. I missed them on that tour and so I can't compare them with nowadays line-up. Anyway, the French took the fans by storm, even if they still sound much like Helloween at the Keepers era. Singer Ben sings like Michael Kiske and sometimes the songs are so similar to their heroes that it could be a cover version... Personally I think that it's necessary for them to develop their own style and to get away from being copycats of Helloween... An aim the band has and so probably next time they will get the attention of all the fans in the venue. Good luck guys! Beside the Bang-Your-Head festival Edguy just play a few single shows and tonight they came to Bochum to play at the Matrix. In May Duke opened in front of about 80 metal fans for Squealer. Tonight more fans showed up, most asked who are Duke? Scanner vocalist Haridon Lee founded a new band Duke! After opening for Squealer the line-up changes, so they still haven't recorded anything yet. So just a few fans know the songs, but the fans of Edguy seems to like their catchy songs like Wild Horse, Letter To A.J. and Friends. Lee liked talked to the people and he called them friends and the band felt like being among friends. Tonight Haridon and drummer Anja gave the new members the confidence in the band and pushed the band to their limits. In comparison with their show in May, they got a lot tighter and I hope that soon they'll have the chance to record their songs. During the break many fans asked at the merchandise booth and ask for Duke! A big compliment for the newcomers. When Edguy entered the stage the Matrix was crowded! Toby and the others entered the stage and the fans gave them a warm welcome. Due to the fact that The Savage Poetry isn't a new album, even if it ain't a re-release as well, the band presented songs from all their albums. The quintet played for about 90 min. a mixture of their songs, musically they did a good job. 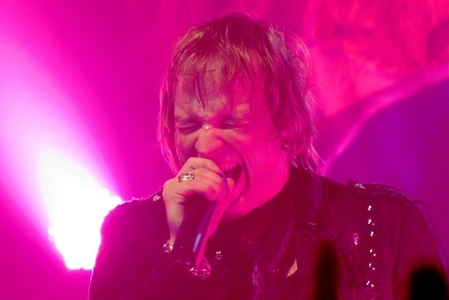 Only Tobias Sammet was suffering from a cold which effects his voice... But that doesn't stop Toby from talking nonsense like he always does. But his funny comments are part of their show and the fans would miss them. Songs like Hallowed, Vain Glory Opera and Sands Of Time sounded fresh and powerful. One reason might be that this band is playing together for years.... The guitar duo Jens and Dirk know the guitar style of the counter-part and even sound problems couldn't effect their playing. Most of the fans seems not to care about the bad sound... A problem almost every band has to face at the Matrix. Another good and funny show of the German youngsters!